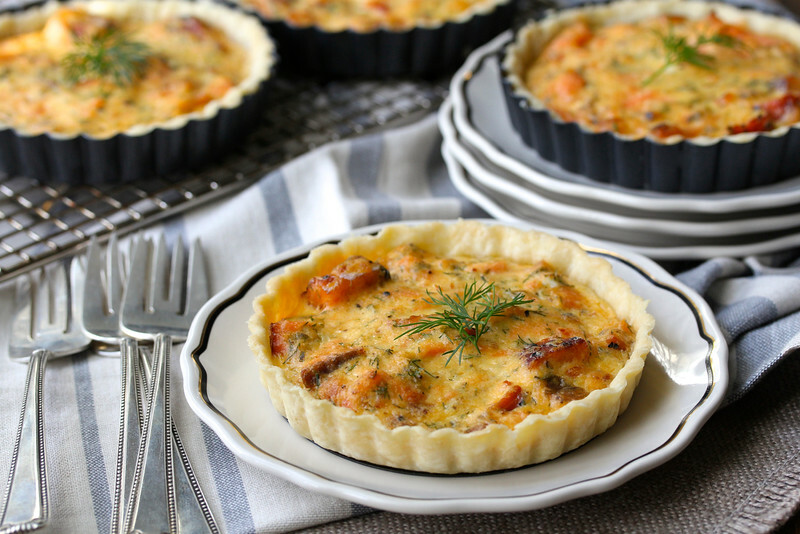 These Smoked Salmon, Dill, and Horseradish Tartlets capture the wonderful flavors of smoked fish. 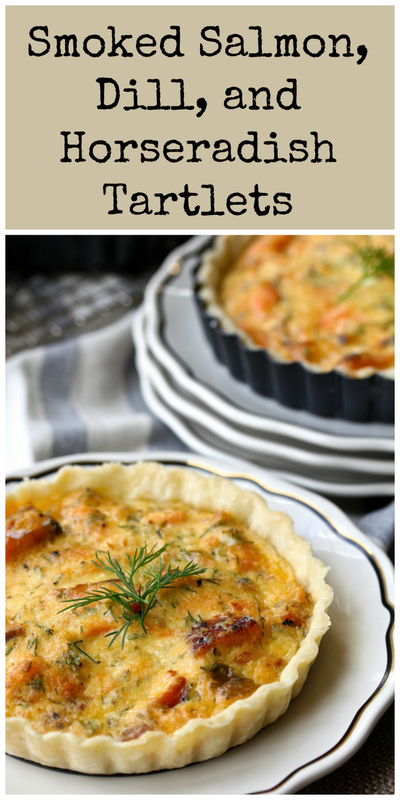 These Smoked Salmon, Dill, and Horseradish Tartlets completely blew me away. The recipe creates just four little tartlets, all of which I wanted to keep to myself. I did share with Mr. Kitchen, and he agreed that these are pretty delicious. 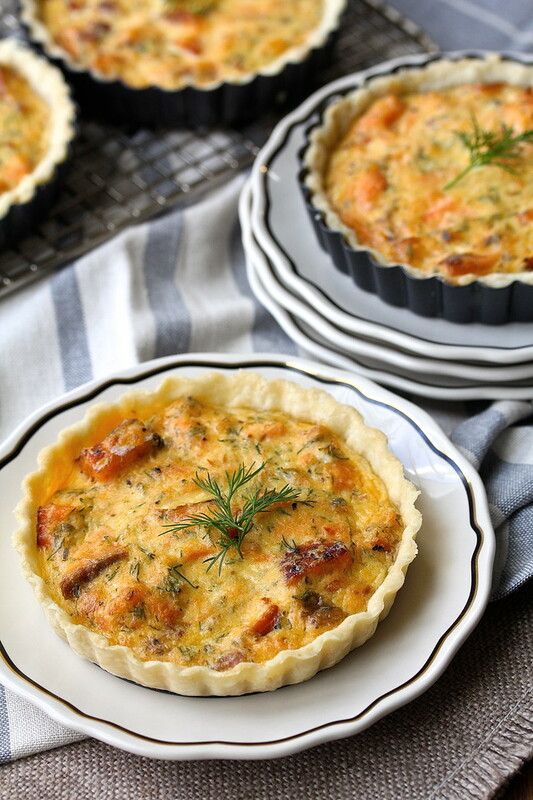 From the super thin and flaky pastry, to the smoked salmon mixed with crème fraîche, horseradish, capers, egg yolks, dill, and chopped smoked salmon, these little tarts are outstanding. This recipe is inspired by Irish pub food. 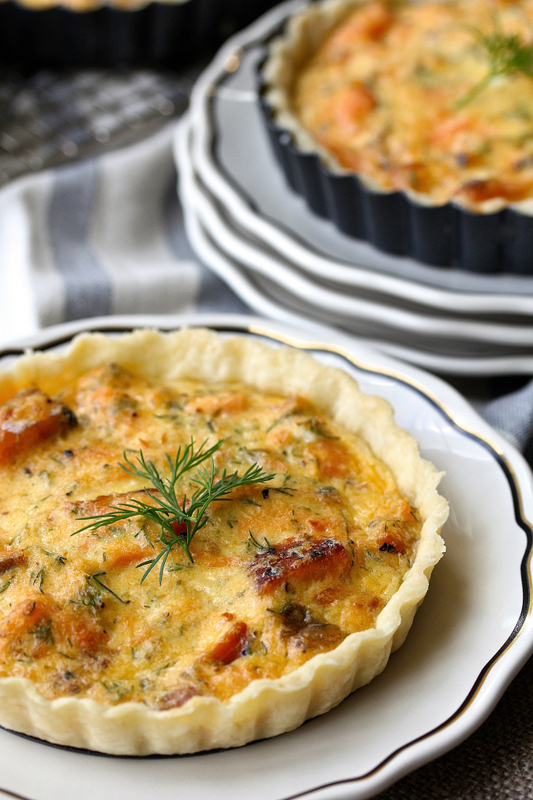 Smoked salmon is ubiquitous in Ireland, and these tartlets showcase the flavor of the fish in such a delicious way. They are wonderful as an appetizer (just cut them into little slices) or a light lunch with a salad. I am partial to smoked salmon filets, as opposed to the thinly sliced lox or gravlax. I really love the filets covered in peppercorns, which I used in this recipe. I encourage you to experiment with this recipe, using whatever type of smoked fish you prefer. These tartlets are wonderful served warm and fresh from the oven. They can also be made in advance and reheated in the oven for about 5 to 10 minutes at 325 degrees F before serving. 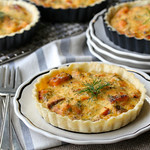 This month, the Fish Friday Foodies, created by my friend Wendy, are making seafood pies or tarts, a theme chosen by Stacy of Food Lust People Love. After the recipe, be sure to scroll all of the way down to check out the links for more fish pies, tarts, and hand pies. Note: The pastry recipe is sugar free. For a less "blonde" looking crust, you can add a bit of sugar to the mixture. I was really amazed at the flavor and texture of these crusts, and loved how thin they were! Add the flour and salt to a food processor (I used a mini food processor) and process for a few seconds. Add the butter, and pulse until the mixture looks like fine breadcrumbs. Add cold water by the teaspoon, and process until the dough just comes together. Lightly spray four 4 1/2 inch tart pans with spray oil. Divide the dough into four equal pieces and form each into a disk. Roll each disk out between two sheets of parchment or wax paper until it is just larger than the tartlet pan. Press the dough into the pan, and trim off any extra dough from the top by rolling the rolling pin over the pan. Patch any "empty" spots with extra dough. Repeat with the rest of the dough. Place a piece of parchment paper in the center of each tartlet and fill with pie weights. Refrigerate the prepared pie shells for 30 minutes. Preheat the oven to 400 degrees F. Bake the pie shells for 10 to 20 minutes, depending upon how brown you'd like your shells (see Note above). Remove the parchment and the pie weights and let cool. In a medium bowl, mix the crème fraîche, horseradish, lemon juice, and capers. Add the egg yolks, salmon, dill, and salt and pepper to taste, mixing carefully to not break up the salmon too much. Divide the salmon mixture evenly among the four tart pans. Place the tart pans on a baking sheet and bake at 400 degrees F for 10 to 15 minutes. Cool for 5 minutes before serving. Recipe adapted from The Complete Irish Pub Cookbook, which I received as a Christmas gift from my darling cousin. Karen, Karen... what am I going to do? Sorry I missed this event. My oven was misbehaving and I waited till the last minute. But I can't wait to try this. Thanks for sharing, Karen. Thanks for stopping by Camilla! I hate when that happens! I once had to move a baking loaf of bread to the toaster oven! Oh my goodness Cheri, thank you! These look so pretty and sound delicious - I actually almost went for something like this before I saw your title, so was keen to see your recipe. Must give it a try! These look gorgeous...add another type of fish and I'm all over them! I still can't wrap my head around salmon no matter how hard I try! Oh, do let me know when you do! Tart is looking so tempting and irresistible. Your pictures are gorgeous, mouthwatering, and now I want to run to the pantry, grab my smoked salmon (yes I keep some in the pantry, you never know when inspiration will strike), and make it. And I will, soon. Awwww. Thanks! I keep smoked salmon all the time! Drooling over the keyboard with these photos:) Exceptional work Karen. A delicious recipe, perfectly balanced. Bravo! Thanks so much. This is definitely one of my favorites.